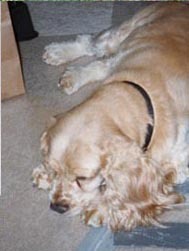 Sunshine died in her sleep on January 17, 2005 after a weekend spent sleeping and unable to eat. We'd taken her to the vet on Saturday and he didn't find anything wrong; she was scheduled to go in on Monday for more tests but died overnight. It turns out that she had a twisted bowel. 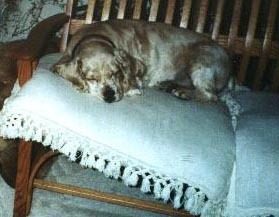 We got Sunshine from a pet store at the mall in Johnson City, New York in August, 1991. She was 4 months old when we got her (born in April); we we got home, we first had to reassure Little Bits, who'd escaped from the basement and greeted us from inside the back yard. At first he was unhappy with this new puppy (and who could blame him, under the circumstances!) but they quickly became friends. Later, after Little Bits' passing, Sunshine took the new puppies Indy and Prancer under her wing, playing with them and correctng them as required. She seemed younger to have them around!